May 6, 2016 – The MESSENGER mission has released the first global digital elevation model (DEM) of Mercury, revealing in stunning detail the topography across the entire innermost planet and paving the way for scientists to characterize fully the planet’s geologic history. The global topographic model was among three new products released today by the Planetary Data System (PDS), an organization that archives and distributes all of NASA’s planetary mission data. With this 15th and last major data release, the MESSENGER mission has shared more than 10 terabytes of Mercury science data, including nearly 300,000 images, millions of spectra, and numerous map products, along with interactive tools that allow the public to explore those data, notes Susan Ensor, who for the last nine years has managed the MESSENGER Science Operations Center, which oversees the collection of these data. “The wealth of these data, greatly enhanced by the extension of MESSENGER’s primary one-year orbital mission to more than four years, has already enabled and will continue to enable exciting scientific discoveries about Mercury for decades to come,” said Ensor, a software engineer at the Johns Hopkins University Applied Physics Laboratory (APL), in Laurel, Maryland. The new global DEM complements an earlier product released by MESSENGER, the topography map derived from measurements by the Mercury Laser Altimeter. Because of the spacecraft’s highly eccentric orbit, the laser altimeter was able to make measurements only in Mercury’s northern hemisphere and near-equatorial region, leaving the topography of most of the southern hemisphere largely unknown, until now. The new product reveals a variety of interesting topographic features, as shown in the animation above, including the highest and lowest points on the planet. The highest elevation on Mercury is at 4.48 kilometers above Mercury’s average elevation, located just south of the equator in some of Mercury’s oldest terrain. The lowest elevation, at 5.38 kilometers below Mercury’s average, is found on the floor of Rachmaninoff basin, a basin suspected to host some of the most recent volcanic deposits on the planet. More than 100,000 images were used to create the new model. During the orbital phase of the MESSENGER mission, images were acquired with a large range of viewing geometries and illumination conditions, which enabled the topography across Mercury’s surface to be determined. “This is the largest control network ever processed using the Integrated Software for Imagers and Spectrometers of the U. S. Geological Survey (USGS),” explained MESSENGER team member and USGS computer scientist Kris Becker. The control network refers to the effort to register all of the images to each other, a step necessary to create the DEM. “This DEM complements many of the other MESSENGER products and enhances the cartographic maps, and collectively they provide a wealth of new information about Mercury for further study,” he added. Also released today is a new map that provides an unprecedented view of the region near Mercury’s north pole. “MESSENGER had previously discovered that past volcanic activity buried this portion of the planet beneath extensive lavas, more than a mile deep in some areas and covering a vast area equivalent to approximately 60% of the continental United States,” said APL’s Nancy Chabot, the Instrument Scientist for the Mercury Dual Imaging System (MDIS). However, because this region is near Mercury’s north pole, the Sun is always low on the horizon, casting many long shadows across the scene that can obscure the color characteristics of the rocks. Consequently, MDIS carefully captured images of this portion of the planet when the shadows were minimized through five different narrow-band color filters. In the map released today, Mercury’s northern volcanic plains are revealed in striking color, as shown in the image below. Today’s release also includes a new global low-incidence-angle monochrome map, as well as advanced products included in earlier PDS releases that have been regenerated from data acquired over MESSENGER’s entire period of orbital operations and with other improvements. Included among those are improved element concentration maps, derived from data collected by the spacecraft’s X-Ray Spectrometer (XRS). Though MESSENGER’s orbital operations ended about one year ago, today’s data release is one of the most important milestones for the project. Archiving the extensive MESSENGER data sets in NASA’s PDS is a lasting legacy of the mission. View an animation of the new global digital elevation model (DEM) created from MESSENGER images online. 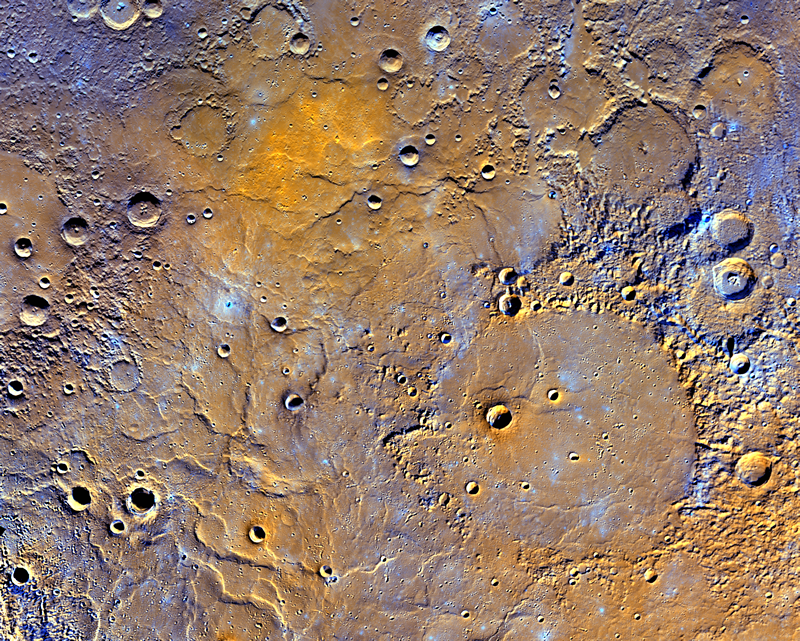 Mercury’s surface is colored according to the topography of the surface, with regions with higher elevations colored brown, yellow, and red, and regions with lower elevations appearing blue and purple. http://pds.nasa.gov/subscription_service/SS-20160506.html, and all of the MESSENGER data archived at the PDS are available at http://pds.nasa.gov. The ACT-REACT QuickMap interactive web interface to MESSENGER data has been updated to incorporate the global Mercury DEM and other revised products for this release. QuickMap can be accessed via links on the MESSENGER websites at http://messenger.jhuapl.edu/ and http://www.nasa.gov/messenger.